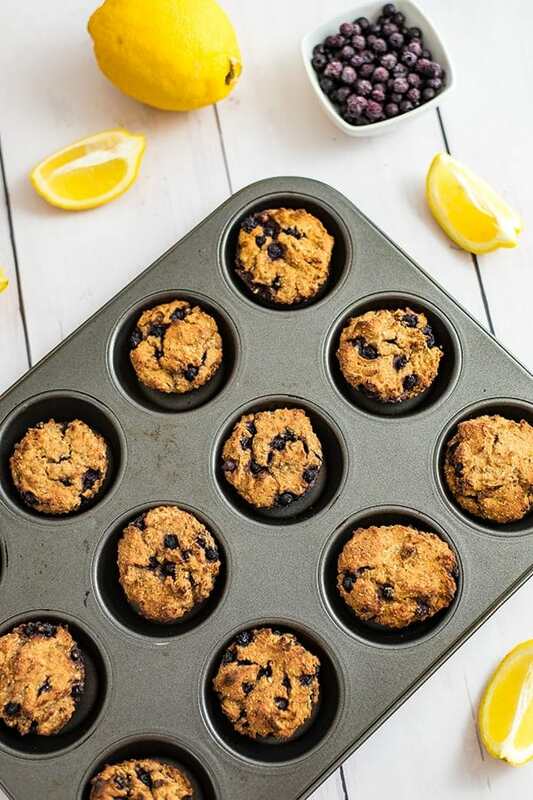 These protein packed lemon blueberry muffins are the perfect way to start the day! 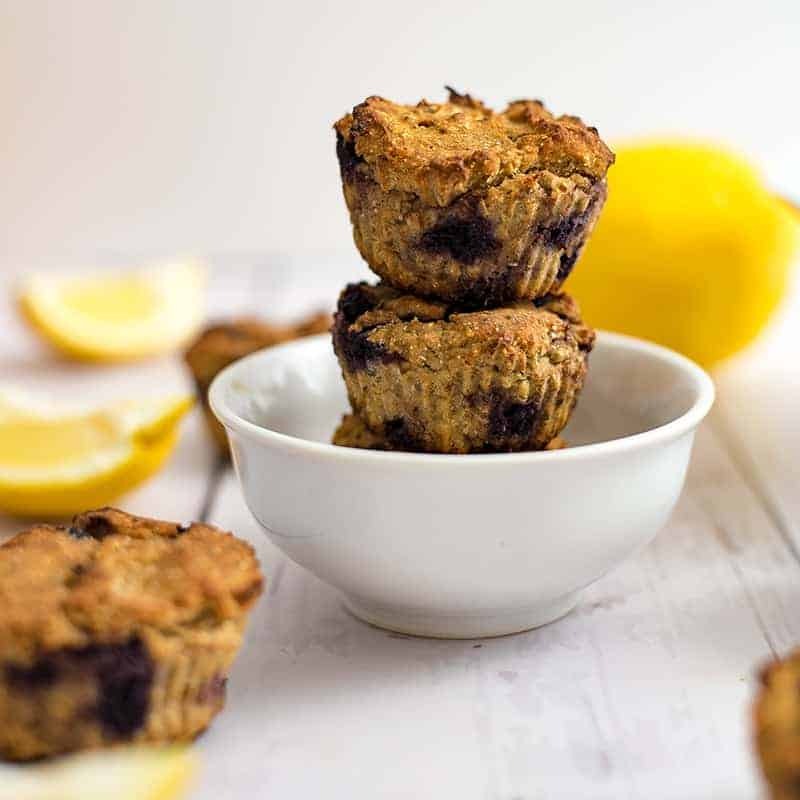 Sweet, satisfying and slightly addicting, these lemon blueberry muffins are vegan, gluten free, and packed with protein, healthy fats and fiber making them the perfect breakfast or healthy snack! In high school I would eat a granola bar for breakfast and pack the biggest bowl of Special K cereal for lunch. I would buy skim milk from the lunch line and eat that on repeat every single day. I was a vegetarian that ate NO vegetables. And I was ALWAYS starving when I got home from school. Like couldn’t get enough food in my body starving. I developed some pretty awful binge eating habits around this time. I remember coming home and feeling like I had to eat until I couldn’t breathe. Looking back, I realize I was likely depriving my body of some pretty important nutrients. Protein, good healthy fats and micronutrients from vegetables to be specific. I remember I would go days and days on pasta, cereal and cheese sandwiches. I struggled with terrible acne and weight issues, which I’m sure my less than stellar diet contributed to. Nowadays I limit my intake of grains, and live a gluten free and dairy free lifestyle, as it’s what makes my body feel it’s best right now! Luckily I have taken action to change my terrible teenage eating habits. These didn’t change overnight and I continue to be open to making more and more changes based on where I’m at in my life. I started these changes by incorporating more vegetables into my meals. I learned how to cook so I was relying less and less on processed foods and started playing around with baking since I could never imagine my life with sweets. I learned a lot from experimenting in the kitchen. For example, you cannot just replace things like butter or sugar with applesauce and expect the recipe to turn out perfectly. You cannot interchange vegan protein powder with whey protein (or collagen or egg white protein) and expect the same results. Eggs and chia or flax eggs do on create the same texture and may require different baking times. But you can make really yummy baked goodies with better quality ingredients! 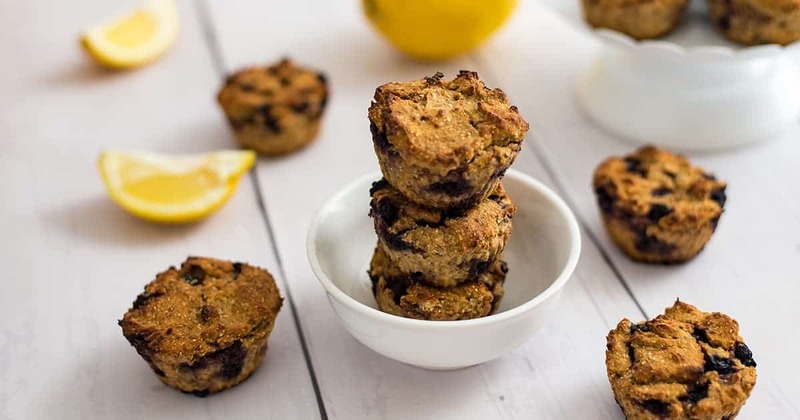 Take these protein packed lemon blueberry muffins. They are packed with protein and fiber to help you feel full and satisfy your sweet tooth at the same time. 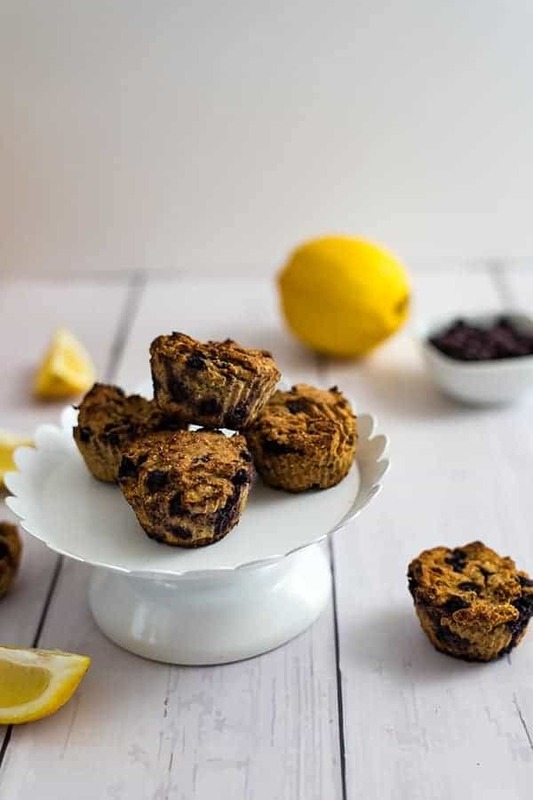 They are made with protein powder, almond flour, coconut flour and other whole food ingredients. 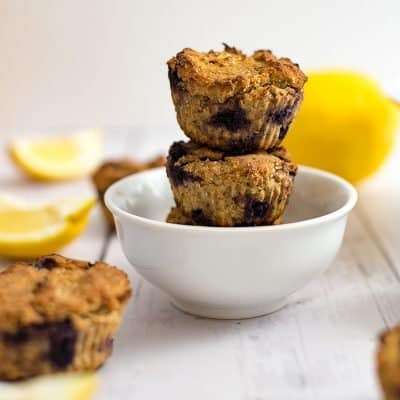 Do these lemon blueberry muffins taste like the muffins as big as your head that you get at the local bakery? No, but I’m ok with that. They are dense, not light and airy, and are much smaller than your traditional muffin (portion control at it’s best). But they do taste amazing and were the perfect way to curb my sweet cravings I often have around 3pm, especially on days I workout! 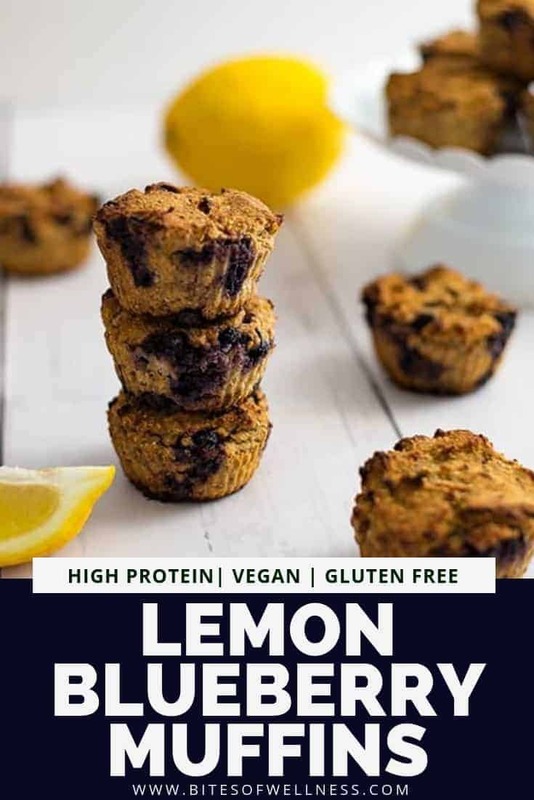 If you love these lemon blueberry muffins but don’t have time to bake your own or don’t feel comfortable baking, you should make my favorite lemon blueberry energy balls! 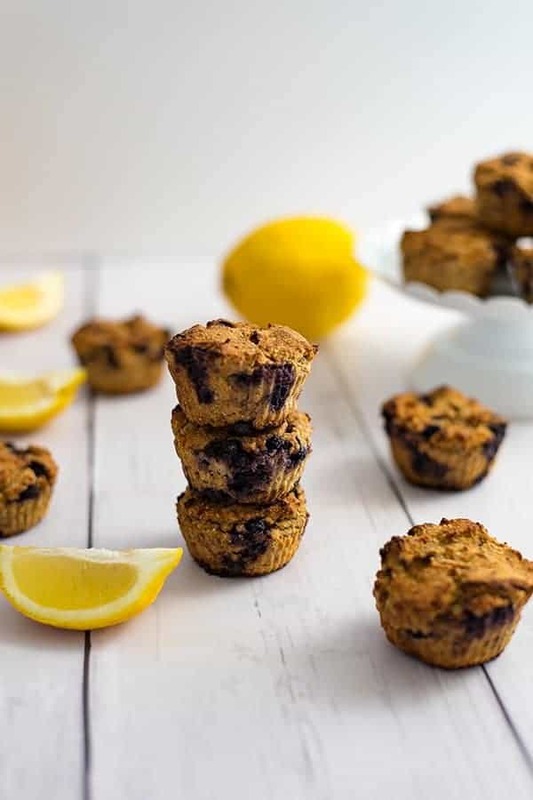 These protein packed lemon blueberry muffins are the perfect way to start the day. They are gluten free, vegan, packed with protein, fiber and healthy fats to help you feel full and satisfied instead of craving sugar all day. In a large bowl, mash the banana. Add applesauce, chia seeds and dairy free milk. Let sit 2 minutes to let the chia seeds absorb the liquid. Zest a large lemon and add it to the batter. After zesting, juice the lemon (make sure to remove any seeds that may be in the liquid before adding it to the batter). Stir in the lemon juice, mixing well. Add the frozen blueberries and stir just enough to incorporate them throughout the batter. Place parchment paper or silicone muffin liners in a muffin tin. Divide the mixture between 12 muffin liners. Absolutely delicious! Thank you for sharing this recipe. What is the exact measurement of 3 scoops of protein powder ?